We are excited to walk and fundraise for this year’s Walk For Wishes. 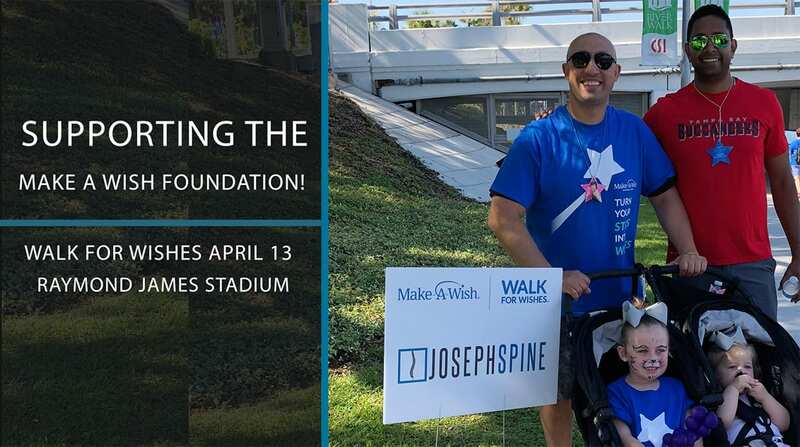 Join, us, Team Joseph Spine, as we walk and fundraise for this year’s Walk For Wishes at Raymond James Stadium in Tampa on Saturday, April 13, 2019. Together, we can raise money for Make-A-Wish to help grant the wishes of children with critical illnesses. Walk For Wishes is a nationwide Make-A-Wish® fundraiser that celebrates the more than 300,000 wishes that have already been granted while raising funds for future wishes. It's a family-friendly event powered by wish families, volunteers, donors, and friends. You can participate by registering to walk or you can donate to a walker or a team. Below is some general information about the walk. You can also visit Make-A-Wish’s subsite Walk for Wishes for more information.